"True love always finds its way back around"
The video has more than 10 million views on Twitter. The touching story of two parents finding their way back to one another after divorce has captured the hearts of thousands of people on Twitter. 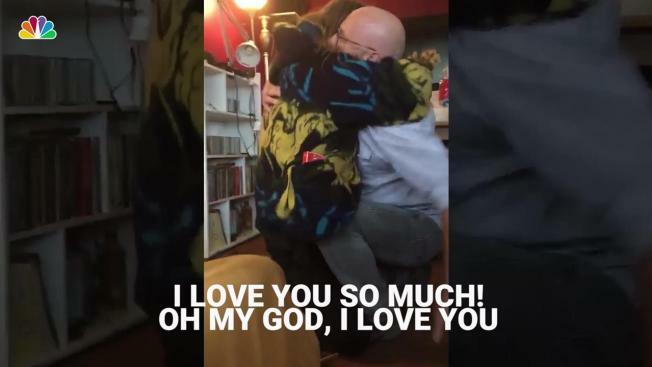 Jeffrey Agan Jr. tweeted a video of his dad proposing to his mom as the family celebrated Christmas. But it wasn't any ordinary proposal. So he says on Twitter, his parents had been married before -- for more than 20 years -- before divorcing. "Years later, they start dating and as of yesterday, this happened," he captioned the video. "Our love was there, it never left. The both of us felt lost. Fate intervened for me and you, our love caught fire and burns anew. "So now I ask you, Lorrie, once again..." she reads, before gasping, dropping to her knees and accepting her ex-husband's second marriage proposal. The video has more than 10 million views on Twitter. Replying to the post, Lorrie Agan comments that it was the most amazing moment of her life. In a separate tweet, Agan Jr. said the divorce had torn his family apart. The couple had raised eight children together. But both parents ended up going on a journey for self renewal, he said. As a result of the tweet going viral, Agan Jr. started a GoFundMe page for people who wanted to donate funds for the couple's wedding. "My dad started going to the gym and lost a ton of weight. He started writing poetry and spending more time with his grand kids," he wrote on the GoFundMe page. My mother found peace in nature, through meditation, and self empowerment." He said his parent's first wedding was held at an electronics store because they were "too poor for a traditional wedding." The fundraiser had exceeded its $2,000 goal within a day. "Congrats Mom and Dad!," Agan Jr. tweeted. "True love always finds its way back around."